On Saturday night terrorists drove a van into pedestrians on London bridge and managed to go on a stabbing spree. The victims amount to 7 dead and three attackers gun down by police. There was also a brutal amount of people who were injured with the number being at least 48. Police have called this a terrorist attack. There is also one Canadian among the victims. 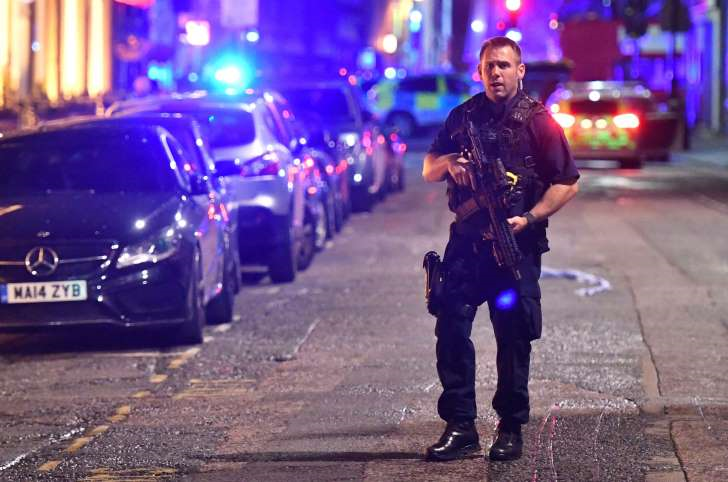 Police officers from around London rushed to the scenes of the crimes armed in case the suspects had more weapons. Officers killed the three suspects and managed to stop the attack. Three suspects were shot dead in Borough Market which is just near the bridge. The officers got to the scenes within eight minutes of getting the call. As flags flew on half mass on Sunday, the Prime Minister Theresa May said "I can confirm that the terrible incident in London is being treated as a potential act of terrorism,"
On Sunday the area surrounding London Bridge was closed off and forensic officers were collecting evidence. The area is packed with bars and it is a hotspot for people in the city to go to as there’s a lot of stuff to do there. There is also remnants of the attacks as buses and taxes just lay abandoned until people can come and claim their vehicles when the investigation is over. The three attackers were wearing what looked like explosive vests but were soon determined to be hoaxes. Over the past two years, there have been Islamic Extremist attacks in Britain, Brussels, Paris, and Nice. The London Ambulance Service said 48 people were transported to at least 5 different hospitals for medical care as they’re injured or critically injured. They also said that there were many others who were injured but it was only minor and were able to be treated on the scene. The London Mayor Sadiq Khan said those who were injured were in a critical state. The Mayor also said that the threat level in Britain remained at severe, which means that an attack is highly likely. It was raised to critical after the Manchester attack but then it was lowered again. Khan also mentioned that he does not think the election should be postponed because of these attacks. “One of the things that we can do is show that we aren't going to be cowed, is by voting on Thursday and making sure that we understand the importance of our democracy, our civil liberties, and our human rights," Khan mentioned. A police officer that was on the scene shared his chilling experience through a social media post that he made after his shift. The officer is known as Roy Smith. Smith said on Twitter "Started shift taking photos with children playing on the South Bank. Ended it giving CPR to innocent victims attacked at London Bridge," he put a broken heart emoji at the end of that post. Witnesses described seeing a white van hitting pedestrians "It looked like he was aiming for groups of people," said Mark Roberts. A management consultant told Reuters that he saw at least six people on the ground after the van brutally rammed through innocent people. “It was horrendous” he added. A taxi driver told the BBC that once the van stopped three men got out with long knives and charged at people randomly and started stabbing them. People also mentioned that people ran into a bar to seek shelter. "People started running and screaming, and the van crashes into the railing behind. We went towards Borough Market and everyone went inside (the bar)," one witness said. Another man who was covered in blood said "They hit the emergency alarm. There was a line of people going down to the emergency exit. And then people started screaming coming back up,"
"Around the corner, there was a guy with a stab wound on his neck ... There was a doctor in the pub and she helped him. They put pressure on the stab wound." BBC Radio said that there were people who were throwing tables and chairs to try and protect themselves from the obvious danger that was happening around them. They threw the objects at the attackers. There is a lot of support for Britain on the world stage as many leaders their deepest condolences. Donald Trump offered U.S aid to Britain in their time of need.